Europe refugee crisis: The EU has failed to confront the wars in Syria and Libya. The refugee crisis is the consequence of Europe’s refusal to confront the wars on its borders. 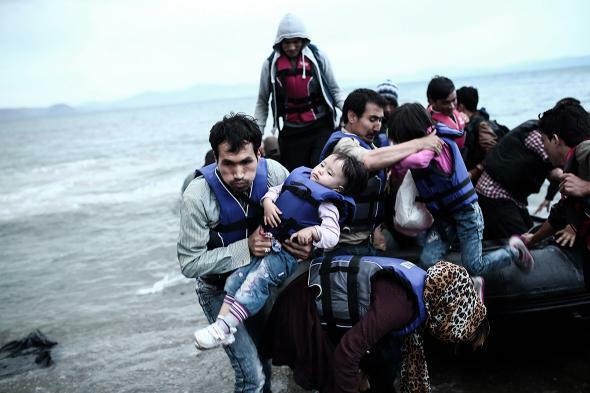 Afghan migrants arrive on a beach in Kos, Greece, on May 27, 2015, after crossing a part of the Aegean Sea. LONDON—Picking apart the layers of irony and hypocrisy that surround the European refugee crisis is like peeling an onion without a knife. At a train station in southern Moravia, Czech Republic, police pulled 200 refugees off a train and marked numbers on their arms. On its eastern border, Hungary is building a barbed-wire fence to keep out refugees, remarkably like the barbed-wire “iron curtain” that once marked its western border. Choose whatever image you want—ships full of Jews being sent back to Nazi Europe, refugees furtively negotiating with smugglers at a bar in Casablanca—and it now has a modern twist. As so often, crocodile tears are falling. The Sun, a British tabloid, has spent a decade railing against immigrants of all kinds. Not long ago, it told the British prime minister to “Draw a Red Line on Immigration—or Else.” Now, after the publication of photographs of a dead Syrian toddler who washed up on a Turkish beach, it wants the prime minister to “Deal With the Worst Crisis Facing Europe Since WW2.” Having just declared that there was no point accepting “more and more refugees,” poor David Cameron has now declared that, actually, Britain would accept more and more refugees. His aides hurriedly explained that “he had not seen the photographs” when he made the original statement. More layers of hypocrisy: Although the photographs are indeed terrible, they aren’t actually telling us anything new. Refugees have been crossing the Mediterranean for months. Hundreds have died. Also, if we are disturbed by a dead child on a beach, why aren’t we disturbed by another dead child in a bombed-out house in Aleppo, Syria? What’s the distinction? Even now, almost all of the slogans being bandied about as “solutions” are based on false assumptions. We should “let in real refugees but not economic migrants”? For one, it’s rarely easy to tell the difference. More to the point, the number of potentially “legitimate” refugees is staggeringly high. As of July, the U.N. High Commissioner for Refugees had registered more than 4 million Syrian refugees, of whom more than a million are in Turkey and 1.8 million are in Lebanon, a country of only 4.8 million people. That’s not counting Iraqis, Libyans, Afghans, and others who have equally suffered political or religious persecution, or even the millions of displaced Syrians still in Syria. Exactly how many of them will Europe take? It gets worse: The law says refugees should “declare themselves in the first European Union country they enter” and then apply for asylum according to EU law. That’s all very well for, say, Ireland. But what happens when tens of thousands of people board boats in Tripoli, Libya, and start heading for Italy or Greece? Now we know: Those two countries have been pleading for assistance from their neighbors for many months, to no avail. And when Hungary can’t cope with the numbers? We’ve just learned: The refugees become a prop for Viktor Orbán, the Hungarian prime minister, who has a fondness for dramatic scenes. 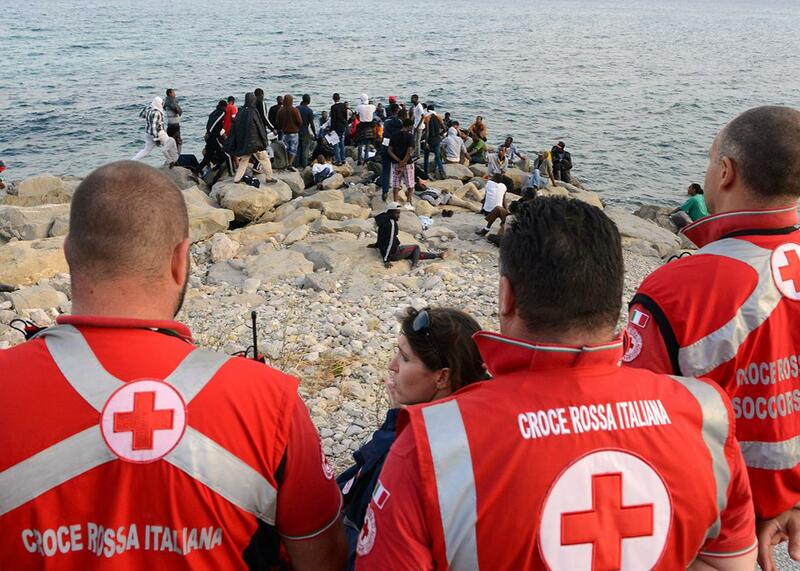 Italian Red Cross workers look as a group of migrants at the border crossing on the Mediterranean Sea between Vintimille, Italy and Menton, France, on June 13, 2015. But if those praising Merkel’s “brave” stance were honest, they would acknowledge that she isn’t offering any long-term solutions either. Even if Europe does take another couple of hundred thousand people, dividing them up between countries—as it should—won’t prevent others from coming. To avoid accusations of heartlessness, the Italian coast guard rescues thousands of people from tiny boats and rubber dinghies. As a result, people keep taking the terrible risk. Here is what no one wants to say: This is, in essence, a security crisis. For years now, Europeans have chosen to pretend that wars taking place in Syria and Libya were somebody else’s problem. It’s also a foreign policy crisis: At different times and for different reasons, all of the large European states—the United Kingdom, France, Italy, Germany—have blocked attempts to create a common foreign and defense policy, and as a result they have no diplomatic or political clout. They haven’t wanted European leadership, and most of them wouldn’t have wanted American leadership either, even if any had been on offer. The richest economy in the world has a power vacuum at its heart and no army. Now the consequences are literally washing up on Europe’s shores. Read more of Slate’s coverage of Europe’s migrant crisis. Also in Slate, see the latest photographs from the European refugee crisis.